The New Movie Let There Be Light is Coming to a Theater Near You! The Christian campus ministry Ratio Christi is excited to be part of a networking team to promote the upcoming movie, Let There Be Light. Directed by actor Kevin Sorbo (Hercules, God’s Not Dead and numerous other TV and movie projects), the film stars Kevin and his wife Sam, their two sons Braeden and Shane, and features Dionne Warwick, Michael Franzese, Travis Tritt, Daniel Roebuck, Gary Grubbs and Donielle Artese. Executive Producer Sean Hannity also plays himself in the movie. Besides being an international model, when Sam Sorbo met her future husband Kevin on the set of Hercules she had also accumulated an impressive acting career of her own, including a Utah Film Festival “Best Supporting Actress” award. Now the Sorbos have three children. They’ve become vocal about their Christian faith, the lack of high moral standards in Hollywood and the American educational system. Ratio Christi had an opportunity to talk with Sam about these topics and the movie Let There Be Light, which is scheduled to open in theaters on October 27. Ratio Christi: What was the deciding factor for you in doing Christian movies rather than mainstream Hollywood films? Sam Sorbo: My husband is very much in the mainstream, but I stepped away from acting when he became very ill. (As described in his book True Strength, at the height of his career Kevin suffered an aneurysm that led to blood clots and at least one stroke. This affected his brain and eyesight, depleted his strength, and drastically changed his life). I had the opportunity to resume my career, but our youngest child made very vocal objections, so I stepped away again. Recently some movie parts have found me, but I wasn’t seeking them out. I never really stepped back into the audition circuit. RC: So you resolved to do faith films because of where the entertainment industry has gone today? Sorbo: It’s more about discernment. It’s just simply, wow — these are the projects that appeal to me and my husband now. And of course, this latest film, Let There Be Light, was a labor of love. As you grow in your Christian faith, you start to understand how incongruous it is with our culture today. Because it is in conflict, the conflict itself draws focus. That’s not a choice. We need Christian people to be pouring into the culture. Without moral values, our culture cannot stand. The money never chases the movie — the movie always has to chase the money! So when the money came looking for us, I took it as a sign. RC: What inspired you, your co-writer Dan Gordon and Kevin to select the plot that is used in the movie Let There Be Light? Sorbo: About a year ago I had an idea for the movie, but a year before that, I had an idea for a faith-based television show. The TV show idea was seen through to a network sale, but the network then decided to go a different way. About eight months later, I had the movie idea. It’s a pretty big idea — the world’s greatest atheist has a huge accident and experiences something that doesn’t fit with his values. I called my friend, who is a very well-known screenwriter, and asked him to write it with me. At first he said no, but when I told him the idea he realized he was eager to work on a project that puts focus on the human condition. We have strayed in our society from talking about things that really matter. This film talks about life and death — what does life mean? So he [screenwriter Dan Gordon] came in with me. Then my husband got a call from Sean Hannity out of the blue. He said to Kevin, “I want to do a faith-based movie — do you have anything?” Wow. The money never chases the movie — the movie always has to chase the money! So when the money came looking for us, I took it as a sign. This kind of thing never happens. We flew out to meet Sean, told him the idea, and he wrote a check on the spot. RC: Without giving too much away, do you hope people watching the movie will turn around as radically as Kevin’s character “Sol” does? Sorbo: I think someone really convicted in their atheism will not have that kind of a spiritual intervention. But there are many people sitting on the fence — so many people who don’t even think about why we are here. My hope is that Let There Be Light touches people enough to engage them on a spiritual level — to re-address their spiritual nature. In any case, I think the movie will move people to reconsider the spiritual realm as real. RC: Is what happens to “Sol” based on what happened with Kevin’s illness? Sorbo: Well, the character has a near-death experience. Kevin never had a near-death experience — he nearly died. There’s a big difference. And he never struggled with his faith. He wrestled with God. The character in the movie has a crisis with his non-belief. He goes into what I call a “memory tunnel.” What he experiences here is nothing like what he thought a guy like him would experience. He thought it would be something very different — being a “party” guy — but he is intelligent enough to realize that what he sees isn’t a hallucination — doesn’t come from his own brain. By the way, the near-death experience has nothing to do with “heavenly tourism,” which is a very controversial topic in some Christian circles. Near-death experiences can be very much like God-given dreams. Though we won’t all be confronted with nearly dying, we will confront the deaths of loved ones and, eventually, our own deaths. The film shows two different people who love each other and how they deal with loss and grief. One chooses faith and one chooses to go it alone. RC: You’ve written a book on homeschooling now (They’re Your Kids: An Inspirational Journey from Self-Doubter to Home School Advocate) and a devotional for families (Teach from Love: School Year Devotional for Families). Why did you make the move into homeschooling your children? Sorbo: I pulled my children out of public school when my oldest son had just finished second grade. We travel a lot, and the school wanted us to teach the kids while traveling and then turn in the assigned work; that way, they get the funds for the child as being in school. So we brought the work along, but my son said the teacher didn’t make him do that work in class. This created a bit of controversy between him and me. So I’m under the authority of the school, my authority is undermined because he was challenging me, and I found that objectionable. When I realized the system was serving him poorly, I decided to try homeschooling. It wasn’t initially a religious decision at all. But then it became clear that what they are teaching our kids, like Darwinian evolution, is just plain wrong. They teach that children (people) are accidents of nature. It’s anti-Biblical, and it’s mean, too. I was scared out of my wits to do it, but the school was not serving him, and I loved him too much to just go along with the status quo, so I began home schooling. Basically, the goal of our Department of Education is “college prep, career readiness, equality.” The evidence is to the contrary. Students entering college are not ready. We’re dumbing down the system to get them in. There’s a further problem — if you want your child ready for today’s economy, statistics say they’ll change jobs many times by age thirty. They need to be life-long learners — not to be taught that learning is done just in school and then it’s over. You can’t have a republic — a democracy — without moral standards. The standard we are teaching in our schools today is survival of the fittest, yet they’re taught everyone gets a trophy — survival of the fittest, but at the same time don’t bully anyone. These are contradictions. There is no impetus to be good. Our young people are very frustrated — they spend $200,000 going into debt to graduate college thinking they’ll have a career with all the perks, and then it doesn’t happen. You graduate from high school in this system, and then you feel incapable to teach a third grader, but you send your child back into that same system? Something’s wrong with that! The opening quote in my book They’re Your Kids is Bertrand Russell quoting the head of philosophy and psychology at Prussian University in Berlin, Johann Fichte: “Education should aim at destroying free will, so that after pupils have left school, they shall be incapable, throughout the rest of their lives, of thinking or acting otherwise than as their schoolmasters would have wished” (emphasis added). Parents put up a fuss when we suggest they teach their own kids. They’ve told me they think they just couldn’t possibly… Well, you graduated high school from this system, and then you feel incapable to teach a third grader, but you send your child back into the same system that turned you out with that attitude? Something’s wrong with that! The Bible doesn’t say “parents, send your children to government schools” and it doesn’t charge the church with our children’s education. So I said to myself, how do I get this done? And I did it. I just met a man who said that when he dropped his child off for kindergarten there was a big opening program, and it had nothing to do with education. It was all behavior modification. But he was afraid to keep her home as a single dad. We talked some more, and he started to envision a way to keep her with him some of the time and find someone to look after her for other times. There’s a way to get it done, if you prioritize. A Sunday school teacher told me that in thirty-two years of teaching Sunday school, no parent had ever asked him what he was teaching. We entrust our children to the care of others quite easily. Maybe, too easily? RC: Regarding educating our kids, you don’t shy away from the political. Tell us about that aspect. Sorbo: My radio show was political for four years. I’ve studied the Communist party goals. They’re documented in our Congressional records. Our education system is a target. The philosophy is, “Take over the school papers and institutions.” This war is for our children. If schools were neutral, they would teach both evolution and creationism. But they’ve replaced Christianity with secular humanism — now the third largest “religion” in the world. RC: How useful do you think an organization like Ratio Christi is, training high school and college students to explain the Christian worldview through history, science, philosophy and the logic of absolute truth? Sorbo: When I was homeschooling and my oldest had reached seventh grade, I became the seventh grade teacher. It was in a Classical Conversations co-op. So I got these books, and started going thru the curricula. One of the courses was apologetics. Wow, I thought. That’s fantastic! It’s a travesty how embedded we are in our culture’s new philosophies. Parents should really be on guard. We live in a secular world where our kids are being challenged in their faith everywhere — TV, radio, internet, movies — they’re being called stupid and naïve for being Christian. For you not to arm your child with the truth is a dereliction of duty, and for the church not to train followers in solid evidence is also a rejection of the church’s duty. It’s a travesty how embedded we are in our culture’s new philosophies. Parents should really be on guard. I have a friend who has a daughter raised practicing Catholic. I told her to be careful because a public university is a dangerous place for believers. I wasn’t even that strong a believer then — the suggestion just came to me. The mother said not to worry — but eventually the daughter came back a full-blown agnostic. The girl has now come back to the truth, but is very angry about the indoctrination, for what she had believed and for denying the truth for so long. RC: Tell us a little about the inspiration for your family devotional, Teach from Love. So I turned this concept into a devotional, with seventy-two characteristics — two per week, with discussion questions. There is five minutes of reading and then discussions, focusing on how to be an upstanding person. We need our children to understand there are certain characteristics they should aspire to. If you send your kids to public school, give the teacher a copy! Teach from Love. RC: When did you realize that you desired to know God and Jesus? Sorbo: My mother was raised as an atheist, but through her my lineage is Jewish. I went to Jewish Sunday school, but since she was not a believer, her atheism influenced me. So I walked away from faith. I focused on education. In my late teens and early twenties, I went out working as a model, traveling the world, making a lot of money — and I started to wonder what was life about? I began researching and realizing there is order in the universe — and that order comes from a creator. I didn’t go looking for God, I went looking for purpose, and discovered God. I went to church with a friend and I like to say that’s where Jesus found me. Sam Sorbo and her team are developing an app to accompany the movie. Ratio Christi is pleased to be a contributor of apologetics resources which will be available on the app! 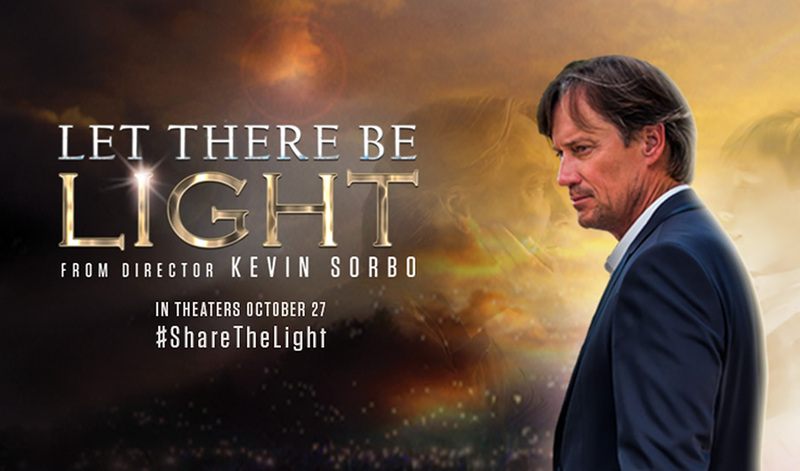 Watch for Let There Be Light to hit the big screen on October 27. This is not the Sorbos’ first foray into family-friendly, faith-based films. Previously besides God’s Not Dead, one or both were involved in Hope Bridge and Just Let Go. Please show your support for these kinds of movies by promoting them on social media and inviting others to join you at the theater. 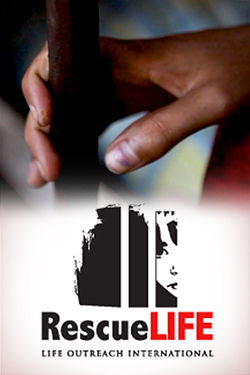 For this new movie, use the hashtag #ShareTheLight. Originally published at ratiochristi.org. Reprinted with permission. *Editor’s Note: Pew Research Rankings in World Education show the U.S ranked 24th to 38th in various subjects: “U.S. students’ academic achievement still lags that of their peers in many other countries, ” Drew DeSilver, 2/15/17, http://www.pewresearch.org/fact-tank/2017/02/15/u-s-students-internationally-math-science/. Retrieved 9/18/17. My sister and I would love to see this movie, however, we live in St. George, Utah and I can’t find it anywhere close to us. Is there a reason for this? I see that it’s playing in northern Utah, so why not southern, come on we believe in God just as much as those in Salt Lake City. Please bring this movie to St. George, Utah there are many, many, many people who want to see this movie and I don’t mean in 5 years after it’s out on DVD or whatever else comes out. Thanks for listening…I hope. Would like to find out when this Movie LET THERE BE LIGHT wil be in Southern Calif.